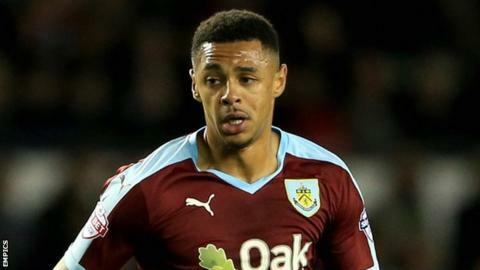 Andre Gray scored his eighth goal of the season as Burnley kept up the pressure at the top of the Championship with victory against Huddersfield Town. The hosts took an early lead when Joel Lynch was adjudged to have brought down Gray, who converted from the spot. He doubled Burnley's advantage after linking up with Sam Vokes to beat Mark Hudson and easily slot past Jed Steer. Huddersfield were handed a late consolation as Michael Duff diverted Kyle Dempsey's cross into his own net. The result means Burnley remain third in the Championship table and have lost just once in their last 11 league fixtures. The hosts went ahead after 12 minutes when Lynch fouled Gray in the box and the Burnley striker made no mistake from the penalty for his seventh goal of the season. Huddersfield, who have picked up just two points on the road this campaign, almost levelled when Paterson played the ball to the onrushing Ishmael Miller, who fired just wide. Burnley nearly doubled their lead as Joey Barton passed to Gray, who turned and found George Boyd, but his strike was well saved by Terriers keeper Steer. The Clarets gave themselves a two-goal cushion going into the break when Vokes beat the Huddersfield backline to tee up Gray to smash home. Nahki Wells worked well to put Huddersfield back into the game but his hooked volley went over the bar, while Emyr Huws' effort was parried by Burnley goalkeeper Tom Heaton moments later. After flicking Dempsey's low cross past Heaton, Duff put the ball into his own net to give Huddersfield a late goal but the hosts held on. "They were two very good goals. The first goal comes off an 11-pass move from our keeper all the way through the midfield into the forwards, allowing Andre to get in behind for a penalty of course. "The second goal was very similar, very good movement, very good passage of play, fine link-up play between Vokes and Gray for a superb strike, I felt. "It makes a game of it, the last five or six minutes with them scoring. It was actually from a corner that we should have gone 3-0 up, we didn't and there is the complexity of football." "Andre Gray showed his class with the second goal, that's why you pay the money and get a player who did very well last year and it's a good buy for Sean and for Burnley. "But my players did what I asked them at half-time and maybe if there was another five minutes, we possibly could have got something from it. "Maybe the goal came a bit too late but I thought our second-half performance was needed after the first half and I got a very good response." Match ends, Burnley 2, Huddersfield Town 1. Second Half ends, Burnley 2, Huddersfield Town 1. Foul by Mark Hudson (Huddersfield Town). Chris Long (Burnley) wins a free kick in the attacking half. Substitution, Huddersfield Town. Florent Bojaj replaces Dean Whitehead. Attempt missed. Harry Bunn (Huddersfield Town) right footed shot from the left side of the box is too high. Own Goal by Michael Duff, Burnley. Burnley 2, Huddersfield Town 1. Michael Keane (Burnley) hits the right post with a header from the centre of the box following a corner. Corner, Burnley. Conceded by Kyle Dempsey. Substitution, Burnley. Chris Long replaces Andre Gray. Attempt saved. Martin Cranie (Huddersfield Town) header from the centre of the box is saved in the centre of the goal. Assisted by Jamie Paterson with a cross. Joey Barton (Burnley) is shown the yellow card for a bad foul. Foul by Joey Barton (Burnley). Attempt saved. Emyr Huws (Huddersfield Town) left footed shot from outside the box is saved in the top right corner. Kyle Dempsey (Huddersfield Town) wins a free kick in the attacking half. Attempt missed. Scott Arfield (Burnley) right footed shot from outside the box misses to the right. Assisted by Joey Barton. Attempt missed. Jamie Paterson (Huddersfield Town) right footed shot from outside the box misses to the left. Assisted by Kyle Dempsey. Attempt missed. Mark Hudson (Huddersfield Town) header from the left side of the box misses to the left. Assisted by Dean Whitehead following a corner. Corner, Huddersfield Town. Conceded by Tom Heaton. Attempt saved. Nahki Wells (Huddersfield Town) right footed shot from outside the box is saved in the bottom right corner. Assisted by Kyle Dempsey. Attempt missed. George Boyd (Burnley) left footed shot from outside the box misses to the left. Assisted by David Jones. Attempt missed. Nahki Wells (Huddersfield Town) right footed shot from the centre of the box is too high. Assisted by Jamie Paterson with a through ball. Corner, Burnley. Conceded by Mark Hudson. Attempt blocked. Michael Keane (Burnley) header from the centre of the box is blocked. George Boyd (Burnley) wins a free kick in the attacking half. Attempt missed. Harry Bunn (Huddersfield Town) right footed shot from the centre of the box misses to the right following a corner. Corner, Huddersfield Town. Conceded by Tendayi Darikwa. Attempt blocked. Jason Davidson (Huddersfield Town) left footed shot from outside the box is blocked. Assisted by Harry Bunn. Foul by Mustapha Carayol (Huddersfield Town). Attempt blocked. Sam Vokes (Burnley) right footed shot from outside the box is blocked. Assisted by David Jones.